Stephen Revell, Opera Rara’s Managing Director, today announced that Charles Alexander has been appointed as the new Chairman of the company. 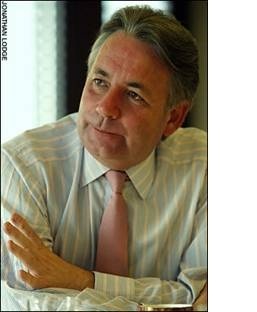 Charles Alexander formerly served as President of GE Capital Europe and was a director and Deputy Chairman of English National Opera. He replaces Patrick Griggs, who held the position since 2004. Stephen Revell says, “I am thrilled that Charles Alexander has agreed to take on the chairmanship of the company. His appointment comes at a critical time and I know we couldn’t be in better hands. Over the past year alone, we have made significant appointments which have taken Opera Rara to a new level: one of the world’s leading conductors, Sir Mark Elder, came on board as Artistic Director and Roger Parker and John Fisher were appointed repertoire and casting consultants respectively. With Charles as Chairman, Sir Mark at the artistic helm and the enormous groundswell of support for Opera Rara, we could not be better positioned for the years to come”. Of the appointment, Artistic Director, Sir Mark Elder, comments, “This is a very exciting time for Opera Rara; it may be small, but the company continues to make an enormous contribution to the opera world and I couldn’t be more delighted that Charles will be taking on this vital role with the organisation in the years ahead“. Says Charles Alexander, “Opera Rara is a unique cultural institution, a shining star in the operatic galaxy. Its fundamental raison d’être, the rediscovery and revival of neglected operatic masterpieces, is based on sound scholarship, exhaustive detective work and brilliance of production, whether recorded or live in concert and I look forward to helping with the next phase of its growth”. For over 40 years, Opera Rara has been bringing back to life the forgotten operas of the 19th Century through performances, recordings and the creation of critical new editions. As a charity, Opera Rara must raise 70% of its income through grants and donations from individual opera lovers, alongside Trusts and Foundations, to enable its work to continue. Charles Alexander’s career spanned 25 years at NM Rothschild & Sons and then at General Electric, where he was President GE Capital Europe. He was a director and Deputy Chairman of English National Opera, a period which included the company’s purchase of the London Coliseum in 1992 and its final restoration in the first years of the Millennium. Charles has served on boards of companies listed in London, Paris, New York, Istanbul and Santiago. In addition to his love of opera, he is a linguist (Italian, French, Spanish and Portuguese), a lover of cricket, has three adult children and lives in London and the Isle of Wight. Over the past four decades, Opera Rara, the brainchild of Patric Schmid and Don White, has been in the business of bringing back to life the forgotten operatic repertoire of the 19th-century. Operas once threatened with extinction have now been brought vividly back to life through Opera Rara performances, editions and recordings. In a world in which recording companies are finding it increasingly difficult to survive, let alone expand their activities, the continuing achievement of Opera Rara is a remarkable success story. The secret of this success is that the company has always remained a highly specialised venture founded on the conviction that there is an inexhaustible mine of fascinating, yet undeservedly forgotten, 19th-century Italian and French operatic music. In the early days, if its recordings were to be commercially viable, Opera Rara could not venture beyond a ‘popular’ composer like Donizetti (its first release, in 1978, was Donizetti’s Ugo conte di Parigi, a totally unknown work at the time). If it risked recording such composers as Mercadante and Pacini, sales would immediately suffer. This situation is now a thing of the past. As more and more people have discovered these recordings, Mercadante, Pacini, Meyerbeer and Mayr have become increasingly ‘safe territory’, while impressive sales can also be expected for even lesser-known composers. More than ever, Opera Rara is now a shaper of taste. Opera Rara has been quick to seize opportunities to capture live performances and has recorded rarely performed works with, amongst others, the Teatro Verdi Trieste, The Royal Opera House Covent Garden and The Edinburgh International Festival. The celebrated concert series with the London Philharmonic Orchestra, at London’s Royal Festival Hall, helped to promote its studio recordings. In a new departure for Opera Rara, the company joined forces with the Orchestra of the Age of Enlightenment to create a studio recording of Donizetti’s Imelda de’ Lambertazzi, featuring Nicole Cabell (Cardiff Singer of the World) in the title role. The recording sessions were followed by a concert performance, another critical triumph. Earlier this year, Opera Rara released Bellini’s Il pirata and Rossini’s Aureliano in Palmira to rave reviews and, this autumn, returned to the studio to record Donizetti’s Rita; for this recording, the Opera Rara team travelled north to the home of the Hallé Orchestra in Manchester. This was its first recording with the Hallé and Opera Rara’s Artistic Director, Sir Mark Elder, conducted his orchestra magnificently. The recording will be released in early 2014. In October, Opera Rara headed to the BBC Maida Vale studios to record Donizetti’s Belisario with the BBC Symphony Orchestra. Again, with Sir Mark at the helm, Opera Rara topped off the studio recording with a hugely successful concert staging of the work at London’s Barbican Hall, a co-production between Opera Rara and the BBC Symphony Orchestra. One of Britain’s critically acclaimed highlights of the opera year, the studio recording is due for release in 2013. Opera Rara aims, through its catalogue of recordings, to continue to encourage, inform and delight with its tireless exploration of rare 19th-century music.